Pioneers in the industry, we offer fire proof doors and fire retardant solvent based top coating from India. India Most comptetive Fire retardant products is tested and certified by centre & State most Competative Govt Lab.Manufacturer & Exporter of Fire Proof Doors.The doors which should be fire resisting and require attention are detailed in the door schedule and indicated on the attached plan. The doors should comply with the following standard. AMEETUFF fire stop doors shall have the performance appropriate to their location. New AMEETUFF fire doors shall either be suitably marked by the AMEETUFF OR THEIR Associates or a test certificate can be provided stating the performance of the door in accordance with BS 476-22 or BS EN 1634-1. 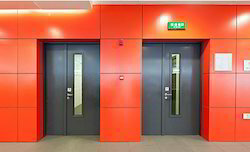 The specification, installation and maintenance of AMEETUFF fire stop doors should comply with BS 8214:2008. Looking for Fire Retardant Doors ?